Deep fry peanuts in batches. Remove and drain them in paper towel. Then deep fry roasted gram and drain them in paper towel. Then deep fry corn flakes in batches and drain them too. Finally deep fry the curry leaves. Transfer to an airtight container and store, if you are planning to store for long. The temperature of oil is very important. It should not be too hot or too low. Too hot oil burns the ingredient and too low makes it soggy. 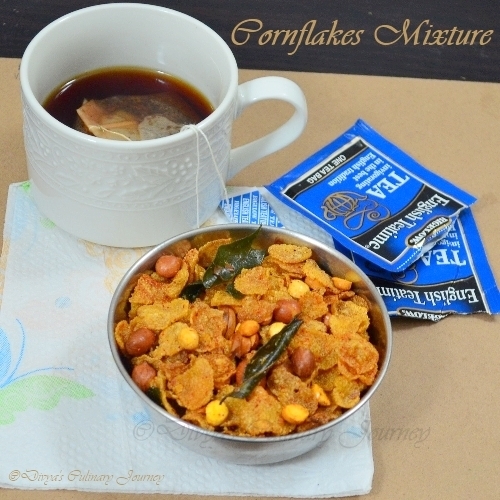 Crisp,quick and delicious.me too made this.favourite snack of my family..
Crunchy munchy mixer...perfect teatime snack. 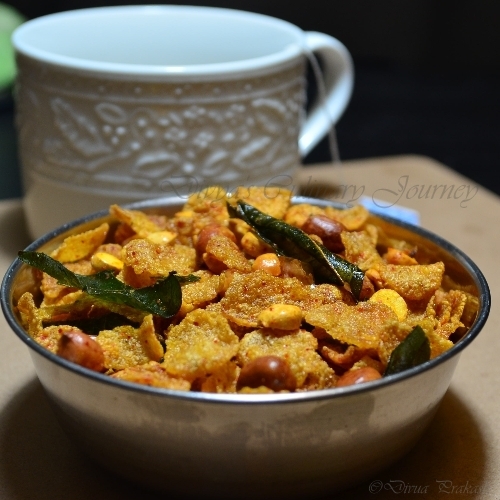 Spicy and super crispy mixture, excellent snack with a cup of masala tea. This is one of my fav snack. Can keep munching.Thanks for sharing.. 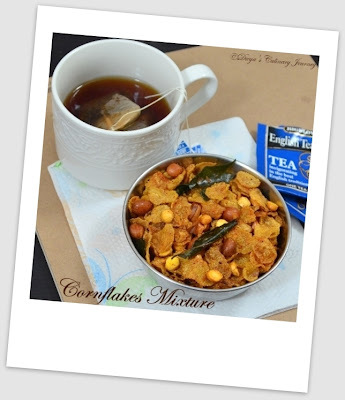 This adds a new twist to the ordinary cornflakes! Nice. Happy Diwali, Divya. Perfectly done,gr8 tea time snack..
Cornflakes mixture looks delicious Divya. Love this simple and easy mixture..